Are you dreaming of making croissants, puff pastry, choux paste, tarts and more? The French Tarte offers small group, hands-on classes in the art and techniques of French style pastry. Become comfortable with a number of base recipes, and you'll be ready to start creating your own delicious baked goods. All classes are taught by Le Cordon Bleu Paris trained pastry chef, Susan VandenBerg, based in Grand Rapids, Michigan. Susan will come to your home kitchen for private ($120 per session) or small group classes of 2-4 people ($65 per person). As long as you have a working oven and decent counter space, it’s all good! Choose your topic, send me a note and we’ll figure out a date and time that works. Click here for specific class information regarding payment and more. Croissant: Learn the process for making this traditional yeasted laminated dough. Shape and bake croissants and pain au chocolat and discover additional ways to use croissant dough. You'll take home your own completed croissant dough as well as freshly baked goods to enjoy. All things tarte: Learn the techniques for making classic tart doughs - pâte brisée, pâte sucrée plus a chocolate version. Add to that some simple fillings that will give you the building blocks to create your own version of a French style tart. Take home your own handmade dough plus some delicious small tarts. 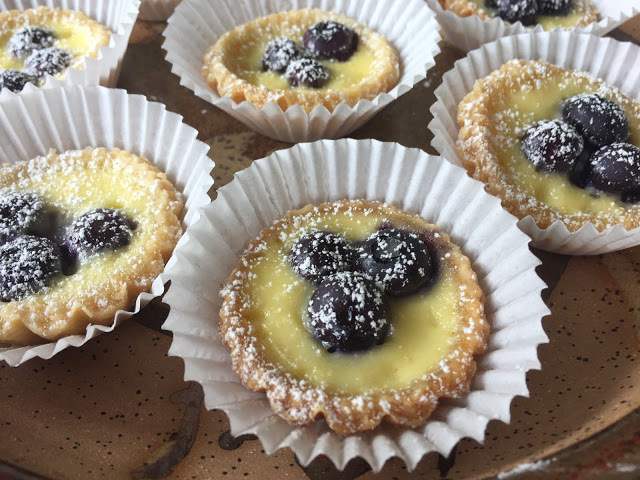 Tarts will vary seasonally. Pâte feuilletée: Puff pastry is a great staple to have on hand for both sweet and savory uses! Learn to make this non-yeasted version of laminated dough. Take home your class-made dough plus freshly baked turnovers, vol au vent and your own free form savory tart. Pâte à choux: It's all the rage in Paris! Choux paste is used to make éclairs, profiteroles and savory gougères as well as many other classic French desserts. You'll learn the technique of making the paste along with classic crème pâtissière and chocolate ganache. Then we'll bake and fill these light and airy puffs and savor our freshly made gougères. Classic treats for afternoon tea: Learn the basics for making two classic French tea cakes, financier and madeleine, along with all butter shortbread cookies and both sweet and savory scones. Take home some goodies for your friends and family. Brioche: Make this buttery, enriched dough, shape and bake brioche à tête and brioche Nanterre to take home and discover some of the ways to create your own brioche buns and spirals . Note: when making brioche at home, it's important to have a heavy duty stand mixer. The world of meringue: Learn the techniques for making French, Swiss and Italian meringue, plus just a few of the ways they can be used - butter creams, dacquoise and chocolate chunk, nutty coconut French meringues. Bûche de Noël: A once-a-year December holiday class, learn to make your own yule log complete with meringue mushrooms and woodsy garnishes. And this one is gluten free! If you are interested in setting up a class in your home kitchen, hop on over to the contact page and send me your request or give me a call at 774-280-4803!